There are many different types of art, such as drawings, paintings, sculptures and masks. What is your favorite type art to look at? What is your favorite type of art to make? 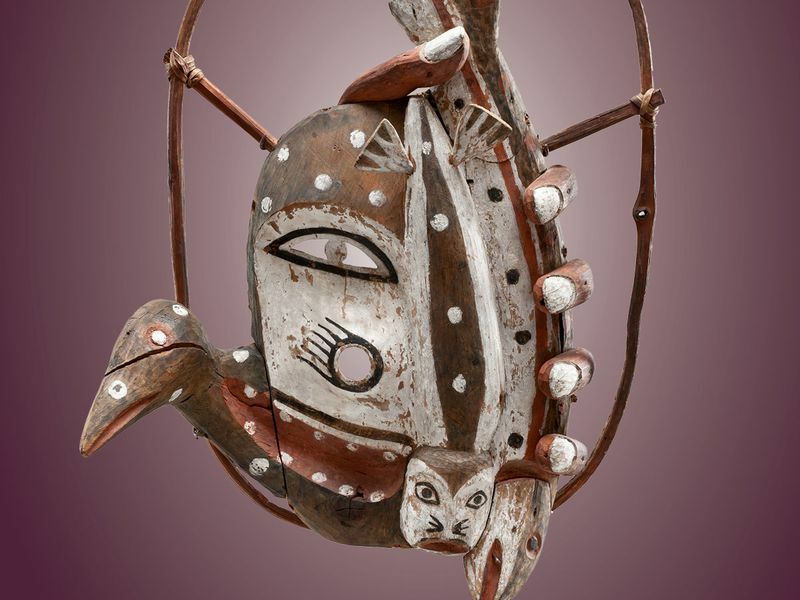 Native American art has typically been shown in natural history museums rather than art museums. Do you think this sends the message that Native American art is less cultured and developed than western art? Why or why not? According to the article, where museums display Native American art has been a controversy for some time. Why do you think this has been such a problem? According to the article, many foreign visitors wonder why there is no Native American art in the Metropolitan Museum's American wing. In other countries, indigenous art is often part of the narrative of their nation's art. What does it tell you about U.S. culture that Native American art hasn't been included in art museums here? As a class, discuss what art is. What kinds of objects are typically considered to be art? Then ask students to share what they know about Native American art. Guide the class to recognize that Native Americans, like people of all cultures, create art. They always have. And the objects they craft are artistic, creative reflections of their culture. Invite students to explore the National Museum of the American Indian's (NAMI) vast collection of Native American art. Encourage students to note the many different types of art that Native American artists produce. Inform students that much of the Native American art they see in museums is hundreds of years old. But there are many Native American artists working today. Their work uses traditional materials to create art that reflects their native culture in the modern world. Have students select a Native American artist and conduct research to learn about his or her work. For ideas on artists, students could explore the NAMI publication, "Native Artists in the Americas." Instruct students to write a brief biography of the artist. Challenge them to also create a museum-worthy exhibit featuring photos and descriptions of the artist's work. Invite students to share their biographies and exhibits with the class. After all of the presentations, encourage students to share what they learned about Native American art. Have students complete the project in small groups. Provide assistance as they identify Native American artists and conduct research to learn about their work. Have students to complete the project with a partner. Encourage them to include at least three examples of the artist's work. Have students complete the project with a partner. As students learn about the artist, instruct them to evaluate the information they collect to identify the most important personal and professional events in the artist's life. Encourage them to include only those details in their biographies. Exhibits should include photos and descriptions of at least five objects the artist has made. Encourage each student to select a Native American artist. Give the class time to conduct research. Instruct students to evaluate the information they collect to identify the most important personal and professional events in the artist's life. Challenge them to explain how being Native American influences the artist's work. Exhibits should include photos and descriptions of at least five objects the artist has made. The objects should be presented in a way that reflects the artist's approach to art. Do symbols mean the same thing in every culture? In this Smithsonian Learning Lab collection, students will discover what stars mean to the Lakota and other Native people. Students will discuss how Western cultures think about stars. Students will use the star quilt pattern to create a symbolic quilt that represents their school. The Infinity of Nations Culture Quest website explores content from the exhibition Infinity of Nations: Art and History in the Collections of the National Museum of the American Indian. Students can explore 25 works of art; the Culture Quest, which features interactive segments focused on 10 objects; and Meet the Artist, which introduces students to five Native American artists and their modern creations. Use this guide from the National Museum of the American Indian to explore traditional dresses made by Sioux women. Through their stories and their art, students will learn about the importance of preserving Native culture and see how families share and pass down traditions. Quilts are not unique. But the way Native Americans and Hawaiians use quilts gives them distinction. Use this Smithsonian study guide to teach students how incorporating quilts into ancient ceremonies and celebrations has helped Native people create a contemporary tradition. This Smithsonian Learning Lab collection explores plaited and twined woven objects from the North Pacific Coast. A link to the website "Woven Together" introduces students to the Nuu-chah-nulth community and language. Simple step-by-step illustrations using easily accessible materials allow students to learn plaiting and twining techniques. With this National Museum of the American Indian study guide, students will examine and understand how abstract expressionist artist Fritz Scholder challenged stereotypes of Native American art. Use this Smithsonian study guide to teach students about the oral culture and history-keeping of the Nakota people, who made the Lone Dog Winter Count. Students will create a monthly pictograph calendar of their own to document a year in their personal history. Read this Smithsonian article to learn about the annual show that brings together some of the country’s best traditional and contemporary artists. Read this Smithsonian article to learn about an exhibit at the National Museum of the American Indian that traces the evolution of Plains tribes’ narrative art from the 18th century up through today’s contemporary works.